Judah Benjamin was born in St. Crox, West Indies in 1811. His parents, Philip and Rebecca Benjamin, were Sephardic Jews whose ancestors had fled Spain during the 1492 Expulsion and settled in England. While shopkeepers in London, they decided there might be better opportunities in the New World. The Benjamin family’s planned destination was New Orleans, which was blockaded at that time, so they landed in St. Croix, eventually settling in Charleston, South Carolina. Judah Benjamin entered Yale University at the age of 14, stayed for 3 years, but did not receive a degree. 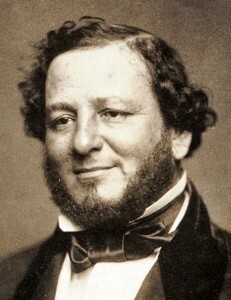 Judah Benjamin moved to New Orleans where he ”read” for the law and was admitted to the bar in 1832. However, he did not start practicing law at that time. Instead, Benjamin taught school and published A Digest of Reported Decisions of the Supreme Court of the Late Territories of New Orleans and the Supreme Court of Louisiana (1834). He then became a partner in what became a very successful law firm, Slidell, Benjamin & Conrad, working with planters and cotton merchants. Benjamin even purchased a cotton plantation with over 150 slaves, which he sold a few years later. This was only time he owned slaves. In 1847, he was admitted to practice before the United States Supreme Court. In 1852, Benjamin was elected to the United States Senate as the first Jew elected to that body. In 1854, he advocated for Douglas’ Kansas-Nebraska Bill, and eventually the Supreme Court’s Dred Scott Decision. In 1861, at the time of Secession, both Benjamin and his colleague, John Slidell, withdrew from the United States Senate. Confederate President Jefferson Davis appointed Judah Benjamin as Attorney General of the Confederacy. He later served as Secretary of War and finally as the Secretary of State. Much to the dismay of historians, Judah Benjamin burned most of his records and diaries before his death. 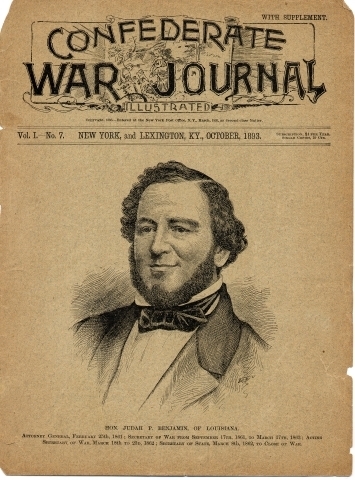 In the chaos after the assassination of Abraham Lincoln, Judah Benjamin fled to England, fearing he would be accused as a member of the plot. In 1867, at the age of 55, he was called to the English Bar. 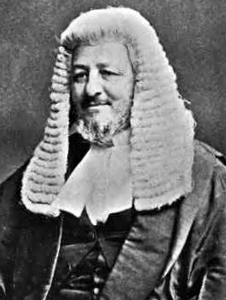 In 1868, Benjamin published A Treatise on the Law of Sale of Personal Property, which brought him honors and an appointment as Queen’s Counsel. In 1883, Benjamin retired from practice due to failing health and moved to Paris. Judah Benjamin died in Paris in 1884. He was buried in the Pere Lachaise Cemetery in Paris. History of the Jews of Louisiana, Jewish Historical Publishing Co. of Louisiana, Old Catalog, circa 1923.